Background – Labosport PSD appointed to review causes of substandard pitch surface and provide recommendations for improvement. Following client consultation resurfacing of the pitch was implemented including installation of DESSO grassmater, managed by Labosport PSD. 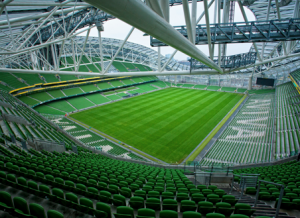 Pitch investigations – detailed assessment of the existing pitch to identify limitations and reasoning for pitch performance being experienced. 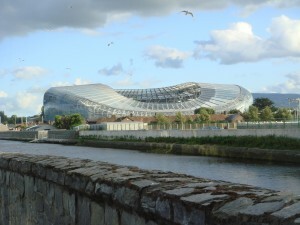 Presentation of remedial options – collection of all available remedial options available, suitability matrix of options for Aviva stadium management company. Recommendations for the most suitable remedial works and programme of works with full costings. Full Project Management of pitch resurfacing: Labosport PSD developed pitch profile designs, contract documentation and contract sum analysis. Key stage inspections during works and approval and certification of materials. Ongoing agronomy support – continued agronomy support and preparation of routine management and renovation programmes. Pre and post concert support – as a multi use facility it requires pre and post concert advisory services including condition reviews and programme of works.